The annual Advisor Fall Welcome took place on October 16, 2018 where Executive Director of Academic Advising, Brett McFarlane and others shared relevant updates and information for the advising community. Per tradition, the event concluded with the UC Davis Academic Advising Awards presentation to recognize outstanding contributions by advisors. Brett McFarlane, Executive Director of Academic Advising, presented on aspirational comprehensive institutional change within a framework of foundational excellence in advising. The Gardner Institute and NACADA partnered to develop these standards to evaluate and improve academic advising in a university setting. The nine interconnected Conditions of Excellence are Institutional Commitment, Learning, Improvement and the Scholarship of Advising, Organization, Equity Inclusion & Diversity, Advisor Selection & Development, Collaboration & Communication, Student Purpose & Pathways, and Technology Enabled Advising. McFarlane shared numerous successful projects that have contributed to better serving students through academic advising, including the First Quarter Course Recommendation Tool (also known as 1QCRT), reconfigured Peer Advisor Training, symposium style conference, online orientation modules, revamped advising at orientation, transfer student experience videos, and the AP/SD resource for students. He also presented a sample map from the advisor mapping project, led by Andrea Duff, which diagrams academic advisors across campus for easy identification. The maps will soon be accessible through the academic advising website. Finally, McFarlane acknowledged the 75 Level One certificate recipients, as well as the three advisors participating in the "next level" certificate, which will ultimately become Level Three. As McFarlane explained, after reflection upon the content and commitment, ATPD recognized the jump between Level One and Level Two was too significant. The ATPD will work to fill in that mid-level certificate area. Karl Mohr, Assistant Executive Vice Chancellor, attended the Fall Welcome to provide an update about changes to orientation. Ultimately, the decision was made to implement the Welcome Week model in 2020 instead of 2019 in order to support a measured, thoughtful, and inclusive transition process. Assistant Executive Vice Chancellor Mohr and Executive Director McFarlane fielded questions about orientation changes from the audience. They also stipulated that the advising community would have further opportunities to contribute to the process, primarily via additional town hall discussions, but also by planning committees that will include advisor participants. College of Engineering Advisor, Lisa Laughter, presented on behalf of the First Year Coordinators' team (Brenna Dockter from L&S, Donna Vivar from CA&ES, and Joyce Fernandez from BASC) regarding a plan to streamline first year advising communications. The campuswide effort aims to better support students with a strategic approach to communication in a condensed and intentional way. Advising Analyst from Undergraduate Education, Nicole Wood, presented on the new peer advisor training that aims to 1) capture a greater number of peer advisors and 2) align the delivery mode more closely with job training by offering modular learning via Canvas and a September in-person training day. Nicole also shared information about the February 7, 2019 UCDAAC (UC Davis Academic Advising Conference) Symposium. 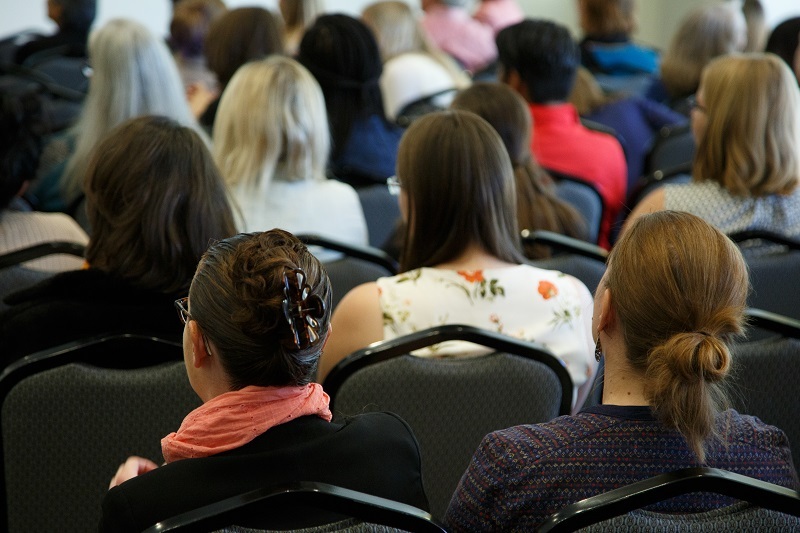 With a format similar to last year, the Office of Academic Advising seeks volunteers to facilitate topic-based conference discussion sessions. The Fall Welcome concluded with Assistant Vice Provost Helen Frasier and Executive Director of Academic Advising Brett McFarlane presenting the fourth annual UC Davis Academic Advising Awards. Congratulations to the 2018 Academic Advising Award recipients! 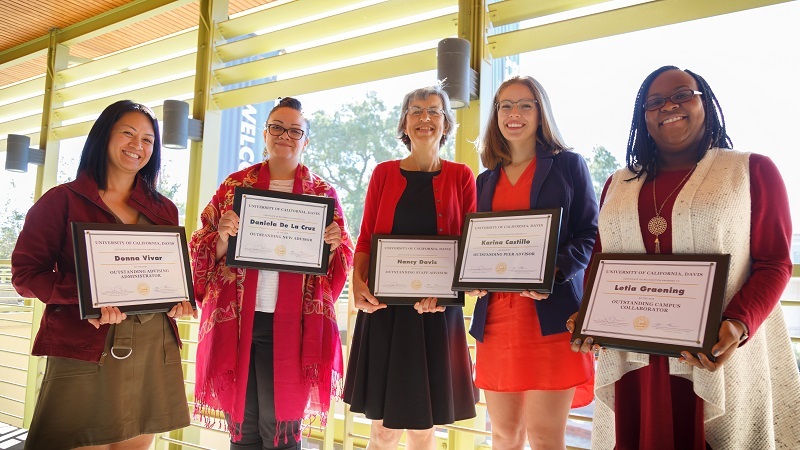 Award recipients from left: Donna Vivar, Daniela De La Cruz, Nancy Davis, Karina Castillo, and Letia Graening (not pictured: Siobhan Brady).